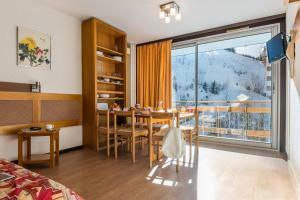 Very good location, near the shopping street and the slopes, yet calm. 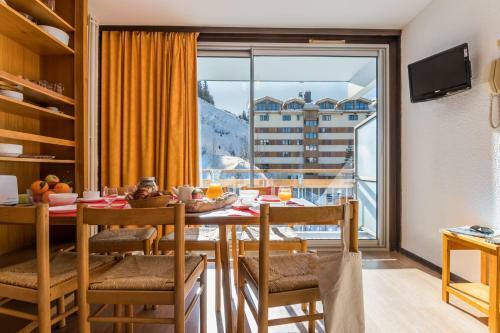 Great value for money in Courchevel. The apartment is conveniently furnished and spacious for 4 people. Garage parking included in the price. Location amazing and reasonably priced for Courchevel. Расположение отеля замечательное, персонал на ресепшен отвечал на все вопросы, но знания русского языка желательно, останавливались в отели системы "MAEVA" второй год. Не первый раз останавливаюсь в этом отеле. Он расположен в 100 метрах от подъемника, продуктоый магазин в 20 метрах, номера небольшие, но имеется всё необходимое (полностью оснащенная кухня: СВЧ, посудомоечная машина, плита, холодильник, посуда). Балкон просто шикарный! На 1 этаже есть комната храниения лыж и ботинок, бильярд, теннисный стол и пару древних игровых автоматов. Смена белья раз в неделю. Тапочки и халатики тут не выдают))). Фена нет. Парковка по предварительному бронированию располагается на другом конце деревни (10 мин пешком). Номер разделен на две небольших части: одна часть с двухярусной кроватью для детей, во второй части - диван для взрозлых. Звукоизоляция номеров достаточная, соседей почти не слышно. Excellente location dans le village. Nous avons également apprécié le parking couvert mis à notre disposition. 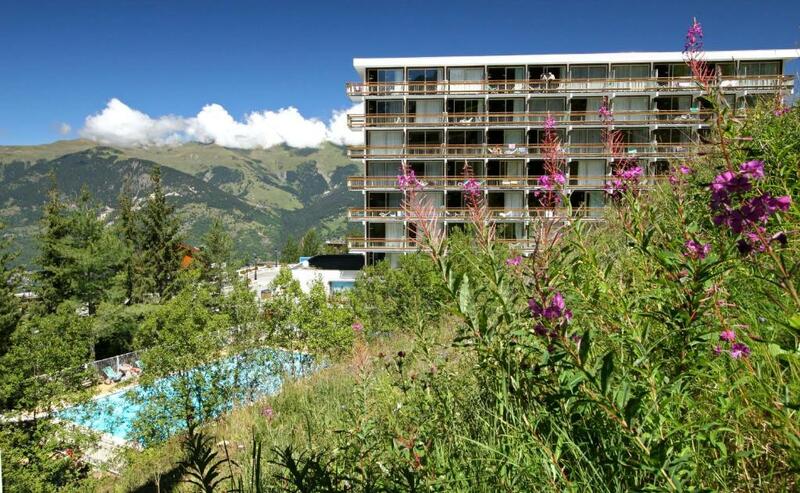 Located in the center of Courchevel ski resort, this residence has ski storage facilities. It is 16 mi from Moutiers Train Station and WiFi is free in the reception area. 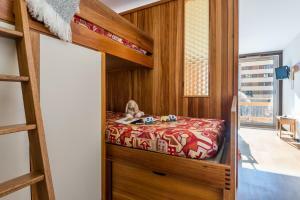 The studios at Résidence Pierre & Vacances le Moriond have a living area and a small cabin with bunk beds. You can relax on the sofa and watch TV or play board games, which can be borrowed from reception. There is a shopping delivery service available at an additional cost. There is also a kettle, coffee maker and a toaster for preparing breakfast and a dishwasher for your convenience. 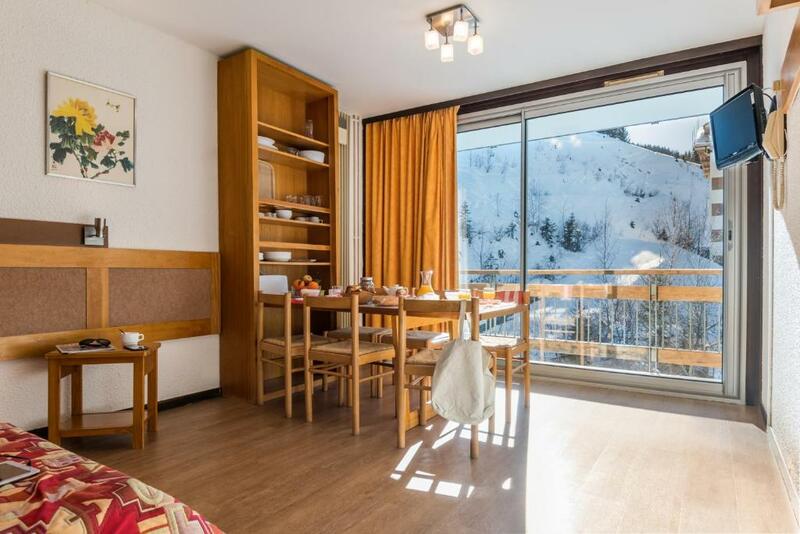 This property is also rated for the best value in Courchevel! Guests are getting more for their money when compared to other properties in this city. When would you like to stay at Résidence Pierre & Vacances le Moriond? These studios have a lounge with a sofa bed and a cabin area with bunk beds. There is also a kitchenette, equipped with hotplates and a microwave. The bunk beds are not suitable for children under 6 years of age. 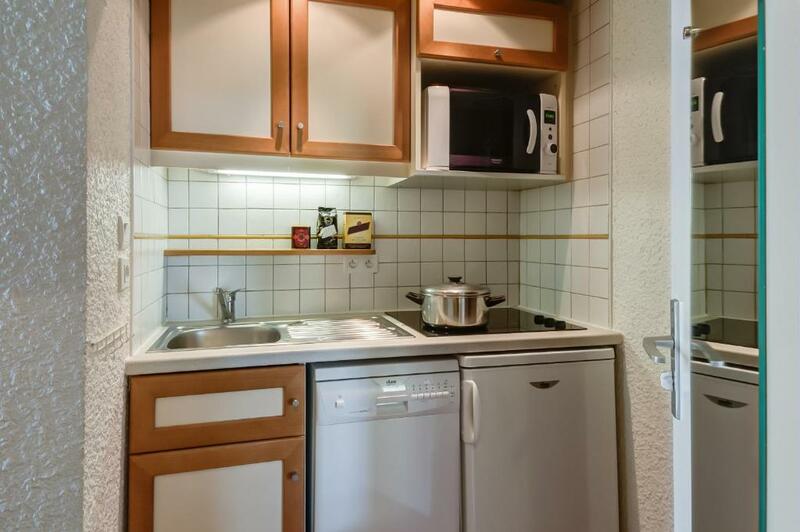 This studio features a kitchenware, balcony and microwave. This studio has a balcony, microwave and electric kettle. House Rules Résidence Pierre & Vacances le Moriond takes special requests – add in the next step! Résidence Pierre &amp; Vacances le Moriond accepts these cards and reserves the right to temporarily hold an amount prior to arrival. Résidence Pierre & Vacances le Moriond accepts these cards and reserves the right to temporarily hold an amount prior to arrival. Please note that these hours are subject to change, please contact the residence before your arrival. The price includes bed and bath linen, television, free access to the outdoor swimming pool of the residence in the summer and all taxes and charges (except the city tax). A baby kit, suitable for children under 2 years weighing less than 15 kg can be requested at an extra charge. The kit includes 1 cot and 1 high chair and is subject to availability. The bunk beds are not suitable for children under 6 years. Staff were not very helpful. No staff to be seen on arrival, luckily after banging on the closed reception shutters for a while someone appeared and showed us our keys were in the safe, though we had not been emailed about this. My key was left in the safe, but the safe was left wide open when I arrived... I was charged full cleaning charge for leaving the linen folded on one of the beds and leaving mayonnaise and bread in the fridge. Apartments are a little tired but clean and good basic facilities. No heating in the ski room, so we were taking the boots to dry in the room. Max number of people is 3 in my opinion for comfortable stay (two bunk beds and one couch/double). We were two friends. WiFi only available in reception area.